This building is probably best known for having a large supermarket in its basement with escalator access to the side-street, but its virtues are really more visible as its façade is one of the most appealing of the new crop of buildings that brought a renaissance to Broadway in the 1980's. The design by Schuman, Lichtenstein, Claman & Efron with Alexander Cooper & Partners for developer Ian Bruce Eichner has a very handsome horizontal fenestration pattern that is appropriate for its full-block frontage on the "boulevard." The window casements are white and the brick is a light-colored red giving the large building a solid, but not somber look. 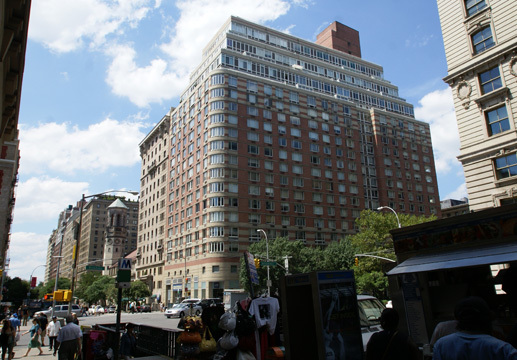 The 23-floor cooperative building has 354 units with 4 passenger and two service elevators. The building has a concierge, doorman, garage, health club and pool, a sundeck and racquetball and squash facilities. Its southeast corner is rounded and there are some double-height apartments on the north facade. The top three floors have a different facade treatment that is not too successful considering how nicely the rest of the building was designed. Beneath them the facade has two floors with light-colored banding, a theme that is repeated abovve the two-story base. It is interesting that the developers opted not to provide a curved corner at 87th Street. 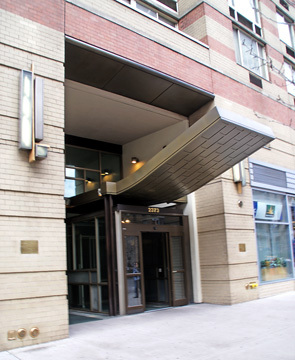 The building has a relative small entrance on the avenue that has a metal marquee that is angled upwards in a rather awkward and not very successful effort to be "modern." It was designed by Alexander Cooper & Partners and Schuman, Lichtenstein, Claman & Efron. 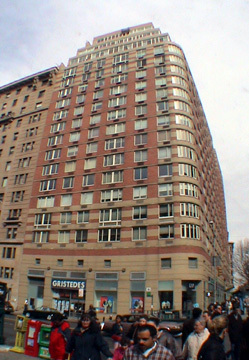 It has a rounded corner at 86th Street and the top six floors are set-back in two-story increments and have mostly glass facades in contrast to the warm red brick facade of the building's large base. 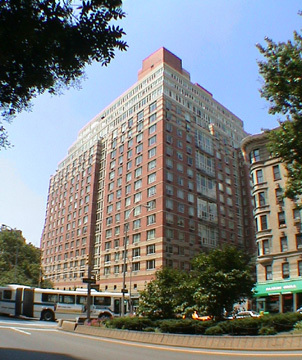 The mass of the base is broken up somewhat by a narrow indentation close to 87th Street that marks its entrance which has an angled upwards marquee, and by the fact that it has beige-brick banding and the 3rd and 4th floors as well as the top two floors of the base.